Zorange for this upcoming school year. For over 10 years Julie has been collaborating with us, specifically with my brother Louis, who began to handle all things education for the foundation. Julie and Louis have been collaborating to perform teacher workshops and seminars. The goal has not been and never will be to totally change the way teachers teach in Haiti but rather to see what can be modified or adopted so that the students in our school and other schools in the community receive the best education possible. Through the years teachers from other schools have participated in our seminars because the ultimate goal is for all students in our community reach their highest potential. Julie will move to Haiti in August 2018. She will be teaching English classes from first to 6th grade. One of Julie’s goal is to develop another Julie in Haiti so that when the time comes for her to return back home the work will continue. The kids will continue to learn English because at least two other teachers will speak English well enough to carry on. 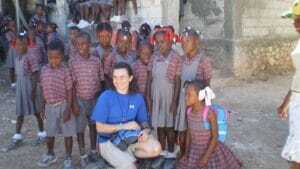 With Julie going to Haiti there was going to be a void that will be felt immediately. Fortunately we have Nicole to take over the position. She has been collaborating with Julie and has traveled to Zorange at least 5 times in just under two years. So this is the good news. But in Aug 2019, Nicole too will be moving to Haiti. She will be working with our science teachers to continue to build on the only science lab in the entire country (physics and chemistry). Sadly some medical schools in Haiti don’t have a science lab let alone the high schools, no matter how good they are. I’ve heard rumors of one or two high school labs but really just rumors. Nicole too will work closely with our science teachers to basically clone herself so when the time comes for her to return home, we won’t miss a beat. The idea of Julie heading to Haiti came because of our goal to provide English classes at our future school in Bainet-Excelsior Leadership Academy. This multi purpose building will be occupied for up to 16 hours a day providing private school, trade school and university studies to the community. The goal of the academy is to provide options to parents that live in the area that typically look to send their kids to schools in Port Au Prince. Adding English classes will be a differentiator that will definitely influence or help the parents pick our school as option 1. Also our passing results at the national exams have already established us as option one in Zorange. conference room, pavilion, library, bookstore, restaurant and many more. Our work in Haiti continues because you’ve been key partners and supporters that keep going and going and going. Thank you for the amazing partnership and support.